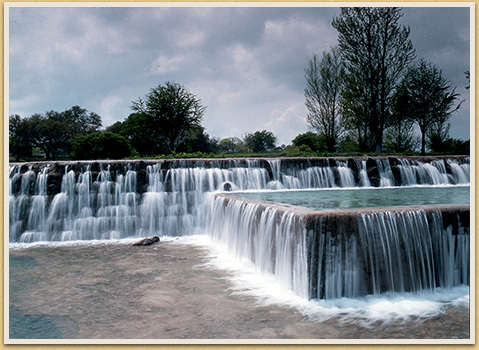 The park stretches along the banks and terraces of the Blanco River. The riparian habitat includes native and introduced plants and a variety of buildings, structures, and features, all of stone. Town Creek flows into the river near the east end of the park and is spanned by a graceful, one-lane bridge built by the CCC just south of the park’s original 1933 entrance (closed due to the realignment of U.S. Highway 281 which necessitated an alternate approach to the park). Park Road 23 takes visitors by park headquarters before reaching day-use features, including the grandest building in the park: the pavilion, which has stone walks and stairs leading to the river, and terrace and benches from which to view the river. CCC-built picnic table and bench units, freestanding benches, and camp stoves sit on both sides of the river. The majority seat four to eight people, but two elongated versions, aligned end to end, stretch a startling seventy feet. When viewed from either short end, these so-called barbeque tables appear as one vast open-air banquet table, suitable for an al fresco feast. Another distinctive feature of the park is a stone chair, or throne, located above the campground; it once allowed a sitter expansive views of the park and the river, but today dense woods block these views. Among the earliest Texas parks improved by the CCC, and designed by project architects and planners C. T. Fohl, A. N. Hanson, L. A. Schmidt, Paul R. Roesle, and Olin Boese, Blanco State Park’s limestone and timber buildings, stone dams, and low-water bridge, all date from a single eleven-month bivouac in 1933 and 1934. Park Road 23, Culverts and Bridges, Retaining Wall and Steps, Stone Walks, Stone Dams, Picnic Tables, Rock Seats, Benches, Picnic Table and Bench Combinations, Camp Stoves, Rock Wall, Concession House-Café (currently a maintenance building), Concession Building (currently the group pavilion), and Pump House (no longer in use). The Custodian’s Cabin burned in 1941 (replacement in a similar style was designed but not built; the current structure dates from the 1980s and does not resemble 1930s-era design). The Entrance Portals, Wells, and Latrine no longer exist.